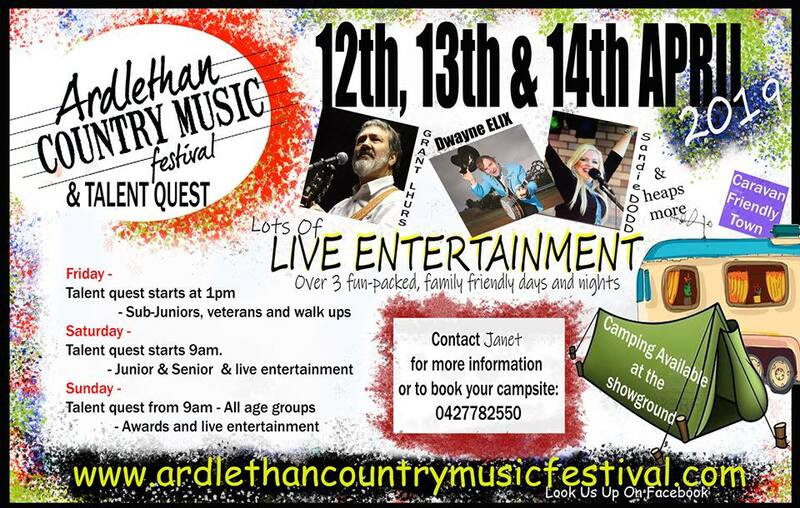 The Ardlethan Country Music Festival is a three day event held at the Ardlethan showground from 12 to 14 April. It doesn’t matter if you’re young or just young at heart, a local or just passing through, everyone is welcome to come along and enjoy a wide range of country music live at the showground over the 3 day event. Our talent quest also runs over the weekend for all amateur singers wanting to try their luck at winning some great prizes, including prize money, recording time at flying fox studios, a new guitar from custom music or one of our handmade kelpie dog trophies. Entry forms are available now via our website www.ardlethancountrymusicfestival.com. Ardlethan is a small country town located in the heart of the Riverina, 1hr north of wagga wagga and 1hr east of Griffith. known as the home of the kelpie, Ardlethan is a friendly, welcoming, fun-loving community with lots to offer visitors to the region. Available services include a foodworks supermarket & bottleshop, Ariah 62 coffee shop, Ardlethan bowling club, Landmark rural supplies, Rellie's rellics gift shop, Ardlee outback rustic & handmade treasures, newsagents and Rod McDermotts electrical & whitegoods store. Powered camp sites are available for the weekend at the showground or if you'd prefer newly refurbished motel rooms are available at the London Hotel Ardlethan.